A Transforming, Healing Presence. And a personal relationship with medical excellence. We believe that any health condition starts and ends with the immune system and its ability to ward off disease or to rebuild and regain health. With this in mind we focus large amounts of time and energy in turning on the immune system—at every level. One of the basic ways our body fights disease naturally is to increase its core temperature through a fever. When the body’s intelligence senses cellular danger or imposition it goes to war through an inflammatory response which sends healing cells like cytokines to the effected area or throughout the entire body; causing heat, redness and inflammation to an area (like in the case of a sliver) or fever, body aches, chills, etc. (in the case of a virus). This is a perfect way of knowing our body is doing it’s job and we are on the road to wellness. In part, this miraculous way of warding off pathogens and other threats is what our technology is designed to focus on and recreate as part of our treatment at Life Health Centers. One of the reasons disease is on the rise is due to the increase in anti-inflammatories and the pharmaceutical advances that allow us to turn off a fever—our body’s first line of defense—in order to go without suffering. While this is understandable since being sick is inconvenient to our normally busy and stressful lives, it is not conducive to giving our immune system practice and at least annually (suggesting a person gets a cold, flu or infection once a year) monitoring and regulating the almost constant interaction our body’s have with toxins, pathogens, and anaerobic cells of all kinds including cancer, Lyme and other serious life-threatening conditions. It’s interesting to note that most chronically ill patients report not having a fever in many years—indicating 1. There are many layers to the immune system and 2. Their immune system is not functioning well. Whole-body Hyperthermia is designed to “turn-on” the cascade of events that happens when the body’s core temperature is increased—a natural healing response. Hyperthermia is defined as a temperature elevation by several degrees above the normal physiological level. Hyperthermia treatment is not new—in fact it’s very old, as old as Socrates, and has been established as a great tool for fighting disease. Currently, there are several ways medicine uses heat to handle varying conditions. However, none of them are as effective as heating the whole body and holding the core temperature at increased levels for an extended period of time. 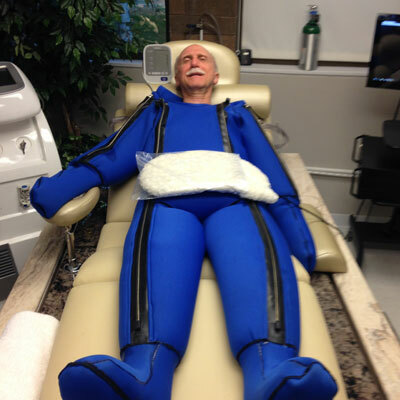 Due to our specifically designed suit and the incorporation of PEMF technology as well as Hyper-oxygenation, we are able to reach resounding effects at lower body temperatures than previously used; this is good news for our patients who are not required to be sedated and are at minimal risk. We manage a very specific balance with heat; making sure to empower healthy cells and organisms while eliminating diseased cells and organisms—again, one of the advantages of our patented technology. Hyperthermia is ideal as a treatment option in itself as well as being a complement for antiobiotics, allowing patients to boost the effectiveness of their medication with whole-body hyperthermia. Life Health Centers is the only clinic in the United States that does whole-body hyperthermia. It is widely used in clinics in Asia and Europe. When considering hyperthermia and its effects on cancer cells we can simply look at the cancer cell’s ability to tolerate high temperatures. While this may seem like a simple solution to a devastating diagnosis, the impacts are mass and not to be taken lightly. A normal cell has roughly 36 ATP (the energy producers in a cell). A cancer cell has roughly 7, making it’s ability to survive much more dependent on what it eats (sugar) as well as its environment. When seduced into high temperatures a cancer cell is inflicted with the inability to create enough energy (ATP) to stay alive; meanwhile a healthy cell not only manages to stay in tact but actually thrives producing enzymes, heat shock proteins and nitric oxide which have a myriad of positive effects on the system. Not only does this engage the immune system but it deposits “chemicals” into the system that can literally change your DNA. Hyperthermia kills cancer cells in tumors, without damaging normal tissues because higher temperatures selectively destroy the cancer cells that are hypoxic (lacking oxygen) and have low pH, a condition of cancer cells and not a condition of normal cells. Hyperthermia increases blood flow. It is well proven that increased blood flow leads to increased oxygenation. When using a whole-body approach (vs. a local approach such as radiation) hyperthermia is able to penetrate all cells, tissues and organs leaving cancer cells no place to hide and making the source of the cancer much less relevant. What does this mean of course, that whole-body hyperthermia addresses the cause of the cancer, not the symptoms and location. For we know that a person encounters cancer cells between 6-12 times a year as well as the notion that just because a mass or tumor grows in your breast, for example, does not mean that the source of the cancer is the breast. In fact, cancer is an immune system dysfunction not a breast, colon, prostate or other organ dysfunction. In contrast, conventional chemotherapy today injures the immune system and destroys many of the healthy cells that are necessary to enable a person to recover from cancer. When considering hyperthermia and its effects on Lyme we focus more on what the hyperthermia treatment is inducing in the body. Lyme is known as a condition that alters DNA wreaking havoc on literally every system in the body. But first, just as with cancer, in order for Lyme to become the major problem for an individual, we must agree that the immune system at the time of invasion was depleted and not working at 100%. Therefore, focus on repairing and rebuilding the immune system is paramount to any chosen treatment and hyperthermia provides the environment in the body to activate and engage the immune system. By heating/thinning the blood, circulation is increased flooding organs and tissues causing interstitial fluid to reach the surface of the skin where it makes an attempt to avert the heat through sweating. When the body is denied this ability (due to the hyperthermia suit technology) the body is forced to produce enzymes, heat shock proteins and nitric oxide, which have a myriad of positive effects on the system. It is the heat shock proteins, that when repaired and activated have the ability to repair damaged DNA caused by Lyme bacterium. An additional benefit to Lyme patients via hyperthermia is it’s effect on biofilms. Biofilms can be equally difficult to treat and also create a huge amount of toxicity in the blood. Hyeprthermia, through thinning the blood naturally and mobilizing toxins, allows for biofilm to be eliminated properly and without side-effects such as herxing. Now, with the addition of PEMF technology built into the whole body hyperthermia system, we are able to generate stem cells and massively increase cellular communication effecting many areas of the body but most importantly for Lyme patients their nervous system and Blood Brain Barrier. Crucial to long-term success with Lyme disease is the effectiveness of the Blood brain Barrier. [Read more about that here.] PEMF has enormous amounts of research showing unequivocal results on repairing damaged nerve tissue (i.e., Lyme Brain). Just because we’re human, the detox component of Whole-Body Hyperthermia is impressive and necessary. We are constantly bombarded with environmental and food toxins beyond our control. Additionally, medications such as antibiotics and chemotherapy, recreational drug and alcohol use, and heavy metals are a reality of being “sick”, which also deplete our body of nutritional absorption and proper immune function. Whole-Body Hyperthermia when heating the body, also dutifully affects the adipose (fat) tissue and structures in our bodies. Fat tissue is where most “toxins” are stored making it possible to have implications in our blood, organs (brain make-up is 85% fat), as well as “extra” fat storage we may have due to being overweight. When the blood and fat are heated they become more easily circulated. Adipose cells are literally knocked loose in the capillaries enabling toxins to become mobile and now available for excretion by the lymphatic system and other detox organs like the kidneys and liver. This is key to not only eliminating “carnage” or waste which has built up over years on our planet, but is critical to getting rid of diseased or dying cells as well as medications which may have been used to treat disease. At the Life Health Centers, hyperthermic toxin removal is a combination of advanced medical modalities designed to detox the body. This procedure is more effective than any other toxin removal technique available anywhere. * When it comes to Lyme patients, which are notorious for herxing after any kind of therapy, we rarely see it. Our treatments are so effective and efficient at turning on the “drainage system” and mobilizing waste (including biofilm). Life Health Centers is the leading detoxification and energy based wellness facility. We eliminate diseased cells holistically without surgery and medication. These physician-provided services are either complementary to your existing or pre-planned physician assisted treatment program or constitute a powerful standalone detoxification program for general health and wellness. The material on this website is intended for holistic, complementary, and alternative medicine educational purposes only. This website is not intended to and does not provide medical advice, professional diagnosis, opinion, treatment or services to you or to any other individual in any manner, and is not a substitute for medical or professional care, and you should not use the information in place of a visit, call consultation or the advice of your physician or other healthcare provider. Furthermore, the equipment (and methodologies) identified herein have not been licensed by the US Food and Drug Administration as a medical device(s) for use in the cure, mitigation, treatment, or prevention of any disease or approved by the American Medical Association or any other government or regulatory agency. If you believe you have any other health problem, or if you have any questions regarding your health or a medical condition, you should promptly consult your physician or other healthcare provider. Never rely on information on this website in place of seeking professional medical advice. You should also ask your physician or other healthcare provider to assist you in interpreting any information herein or in the linked websites, or in applying the information to your individual case. Medical information changes constantly. Therefore the information herein or on the linked websites should not be considered current, complete or exhaustive, nor should you rely on such information to recommend a course of treatment for you or any other individual. Reliance on any information provided on website or any linked websites is solely at your own risk.